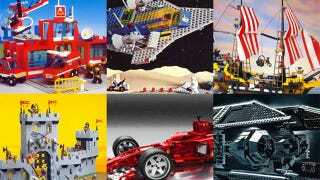 To end the celebration of the 50 years of the LEGO brick, here are the best sets in history. Handpicked from Lugnet—the biggest LEGO database—based on their popularity, these 229 sets belong to the most iconic lines—LEGOLAND Space, Town, Castle and Pirates—plus three of the most popular ones—LEGO TECHNIC, Star Wars and Racers. From the most significant to the most amazing and complex, from the late '70s to today. We can't get ourselves to pick the Best of the Best. Jump, see them all and decide for yourself (plus the official LEGO video of 50 years of the brick). I remember the first time I played with LEGO bricks. Shiny, perfectly smooth and with that unique smell of plastic, which back then I imagined was probably captured by magic elves in Denmark. Today it's almost the same—shiny and perfectly smooth, except the elves are now blue-eyed buxom Danish Valkyries in skimpy LEGO swimsuits. As someone who grew in the Golden Age of LEGO, I just can't decide on any particular model as the Best LEGO Set EVER. I have to confess a soft spot for LEGO Space, yes, but also for TECHNIC. And Town. And of course, although this is way later in my LEGO career, Star Wars. But the soft spot for all those old models from the late '70s and early '80s is the key here: even if I sound like a total nerd, seeing some of these give me a warm, fuzzy feeling in my tummy—some even make me teary. Seriously. It's not like the Galaxy Explorer, the Space Command or the big TECHNIC Helicopter were all that special. It's what happened around them what makes them special, the countless hours I spent with my brothers and father building a thousand combinations of vehicles and weird buildings. It's all that fun, all those days of complete and most absolute happiness which comes back just by looking at the box photos of those sets. And that's what makes them so special, so emotionally charged. They bring back the best in me. Today I marvelled again at the popularity of that simple LEGO brick timeline, and I guess this, the emotional link, must be the reason why LEGO stories are so popular among all our readers. Not because LEGO bricks are cool, which they are, but because they are inevitably linked to intimate memories, to happy memories, the best memories, shared with family or friends or completely personal. For all that: happy birthday LEGO, and thanks for all the bricks.